Bariatric Heavy Duty Comfortable Shower Bench. The Bariatric hevy Duty Shower Bench has been designed with a number of features that help provide a comfortable seat for bariatric users. 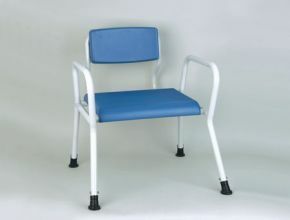 The backrest can be adjusted in depth +/- 60mm (2¼") and has curved tubing to ensure comfort for any body shape. Having the right height for the user ensures success in getting in and out of the chair and these chairs are adjustable from 420 to 550mm (16½ to 21½"). ‘Butterfly' armrests ensure the body doesn't get squeezed getting in to and out of the chair whilst providing a good grip for sitting and getting up. The high-tech, lightweight tubing provides the highest strength at the lowest weight and the removable seat pad ensures these items are easy to clean.